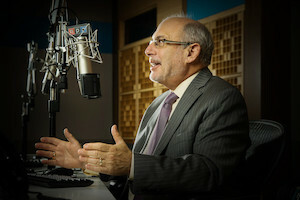 As National Public Radio’s senior host for the nation’s most-listened-to, afternoon-drive-time news radio program for 30 years, Robert Siegel delivered the day’s news to millions of listeners across the country who tuned in to find out more about the events shaping the world around them. And he was there to report on many of the most memorable events of the last four decades. He was in New York City on September 11, 2001, where he ended up reporting on the tragic events that unfolded that day. When a massive earthquake hit Chengdu, China, Siegel was there to cover the aftermath. Robert launched his journalism career in New York, where he was a morning news reporter and talk show host for WGLI radio and later was a reporter, host, and news director for WRVR radio. From there, he joined NPR, where he would work for 40 years across a variety of roles, opening the station’s London bureau and directing its news and information department before becoming the host of All Things Considered in 1987. He hosted the show for 30 years, during which Robert’s name became synonymous with NPR, before he retired in January 2018. “Up until he left, Robert was the voice of NPR. Who didn’t know Robert Siegel?” said Carline Watson, executive producer of NPR’s All Things Considered. His impact extended far beyond the familiarity of his voice and into the lives of NPR’s listeners, who turned to him for a little over two hours each day to find out the latest in world events, politics, economics, history, and more — and why it mattered. “Robert’s whole professional life was based around the public’s right to know, the importance of shining light in places where it’s not,” said Low. In addition to Robert, the Reporters Committee will honor The New York Times Executive Editor Dean Baquet, Florentine Films documentary filmmaker Lynn Novick, and BuzzFeed Vice President of Legal and Associate General Counsel Nabiha Syed on May 22, 2018, at the Freedom of the Press Awards.